EU Summit: what does it mean for the GBP? The main focus for all traders of the British pound will be on the European Summit. The European leaders will decide on the prolongation of the Brexit process today. The summit will start at 19:00 MT time and may continue until Thursday’s early hours. According to analysts, the most widely expected extension is going to be until December 31. At the same time, reportedly the EU is ready to suggest the 1-year extension until March 2020. As we know, the British Prime Minister Theresa May does not want such a long extension, as she thinks that it’s a destructive move against the British economy. Instead, she wants to request an extension until June 30. This decision is seen as too risky for the current path of the Brexit process due to the disapproval of Theresa May’s deal at the Parliament. As the uncertainties about Brexit decision keep circulating, the length of the UK divorce process from the EU will determine the direction of the British pound. What are the possible scenarios? If the EU members agree on a short-term extension, the GBP will be supported. However, we need to look at the other news concerning the further May’s steps over Brexit. If the agreement with Northern Ireland’s DUP party and the cross-party talks between the Conservative and Labour parties are unsuccessful, it will hurt the British pound. In addition, French President Emmanuel Macron said that the short-term extension would be better, as it would prevent the risk of Eurosceptics during the EU Parliamentary elections next month. In case of the long-term extension, the GBP will also rise. However, the long-term delay will possibly weaken the GBP in the long-term period. If any disagreements between the EU leaders come out, the British pound will fall. What are the key levels? 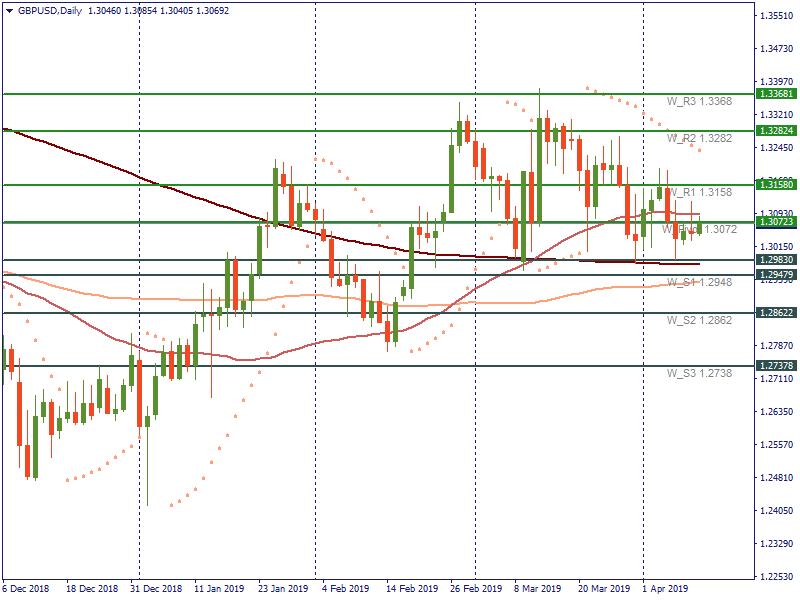 On the daily chart of GBP/USD, the pair has been testing the resistance at the central pivot at 1.3073. If this level is broken, the next resistance is placed at 1.3158. In case of negative news, the GBP will fall to the support at 1.2983, which lies near the 200-day SMA. The next support is placed at 1.2948. If we look at indicators, Parabolic SAR shows the downward movement for the pair.